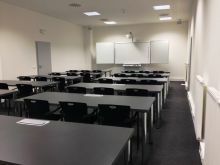 There are 115 above standard rooms, restaurants and a student club in our new modern building in Prague Kunratice. The accommodation for students offer includes twin-, three- and four-bedded apartments for rent. This type of living for students grants ideal conditions in above standard equipment – own bathroom, fridge, plasma TV, tables, wardrobes, beds, internet and common kitchen.